← RECOMMENDED: Mettler Family Vineyards 2005 Petite Sirah, Lodi, CA. Available for as little as $17.33. 14.2% ABV. Confession time: This is the first Mendoza wine I’ve liked. Ever. The Malbecs have been harsh and austere and I just kind of gave up after a while. I’ve liked a couple of them at tastings, but upon tasting from the bottles brought home, the experience simply didn’t match up. To me, this signals instability. The Frugal Wine Snob loves, and recommends, stuff we may rely upon, not stuff which is risky. However, always open to a new experience of Good, we sampled this delightful white blend at a wine tasting Thursday night. Ever hopeful, we were so impressed, we brought a bottle home. Tonight I felt like something cold and refreshing; it’s still nearly 90° in Florida during the day and quite warm this week at night. So, with a whopping [not!] 24 hours’ rest and refrigeration, this wine was cracked open earlier tonight. Its name, Amado Sur, means, appropriately, “fall in love with the south”—and it was even better than it was at the tasting. At last! The Mendoza spell has been broken. APPEARANCE: It presents with a light straw color. Clear. Nice tear-drops (relatively light alcohol content). NOSE: Faint aroma (until it warms in the glass), not preparing us at all for the zingy taste at all temperatures. TASTE: Wow! Slightly effervescent (flattens after a few minutes of warming up in the glass). Very tart on the middle of the tongue. Melon, citrus, honey, lychee, green apple. Something clean and astringent—like an essential oil-based dryer sheet or baby powder or something. Pleasant and soothing. Tiniest hint of cloves and cinnamon. After warming up in the glass for a few minutes, the effervescence disappears, and the wine becomes both smoother and more richly silky. This is an interesting, friendly, yet complex wine, and I can see serving this with our Thanksgiving dinner. I had already picked out a 100% Viognier (White Knight), and maybe we’ll serve both just to experience the differences. * Silver, 2011 International Wine Challenge. LABEL NOTES: Torrontes is from the South. Exclusive to Argentina, at the foot of the Andes Mountains, Torrontes delivers fresh, perfumed wines. A touch of Viognier confers this blend’s citrus notes and sweet finish, while a dash of Chardonnay emphasizes its elegance and structure. WEB NOTES: Trivento means three winds. The Polar, Zonda and Sudestada winds blow across the sunny and arid land of Mendoza. This entry was posted in Argentina, Torrontes, White Blend. Bookmark the permalink. One Response to RECOMMENDED: Trivento 2010 Amado Sur, Mendoza, Argentina. 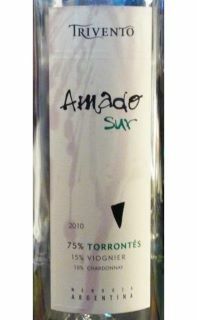 75% Torrontés, 15% Viognier, 10% Chardonnay. $14.29, available for as little as $9.99. 13% ABV. HaHa — By the way, all those “rivulets” on the label are totally part of the design, not what we did pouring this [white] wine!